JACKSON, New Jersey (WABC) -- The world's largest theme park is unleashing the twisted mayhem of one of the most notorious villains in comic book history. Six Flags Great Adventure is debuting its newest roller coaster, The Joker. The ride takes inspiration from the chaos created by Batman's infamous nemesis, incorporating the unpredictable spinning of carnival rides into a modern roller coaster. "This genre of ride is so unique," roller coaster expert Tim Baldwin said. "There is no track below you and nothing above you, so riders are truly doing these acrobatic maneuvers mid-air. The combination of flips, drops and ultra-cool straight-up 120-foot lift makes this coaster totally different than all the other world-class coasters at Great Adventure." 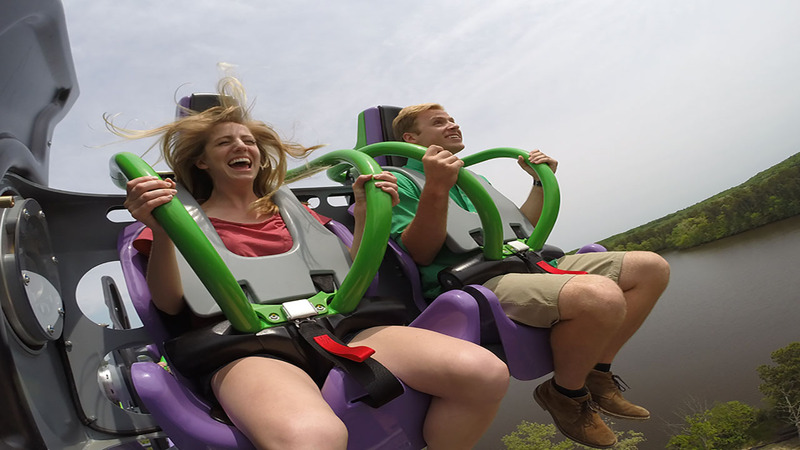 The coaster is painted in the Joker's unique purple and green two-tone design and its 4-D, free-fly wing vehicles allow riders to face each other as they tumble head over heels. Two beyond 90-degree drops create the sensation of free-falling. The Joker previews to season pass holders through Friday evening, and opens to the general public on Saturday. For more information about the 2016 season visit Six Flags Great Adventure's website.